Funktioner för hanterbarhet -HP Lights-Out 100i Standard provides the following OS-independent remote control capabilities: Virtual power; System event log access; System health; Remote serial console (serial redirection); Browser, Telnet access; SMASH-CLP compliant; IPMI 2.0 compliant ;-HP Lights-Out 100i Select Pack provides license key activated upgrades to the following: Virtual media (Floppy and CD); Secure Socket Layer Encryption; Secure Shell Encryption; -HP Lights-Out 100i Advanced Pack provides license key activated upgrades to the following: Virtual KVM (KVM over IP functionality embedded on the system board) plus all of the LO100i Select Pack features above. 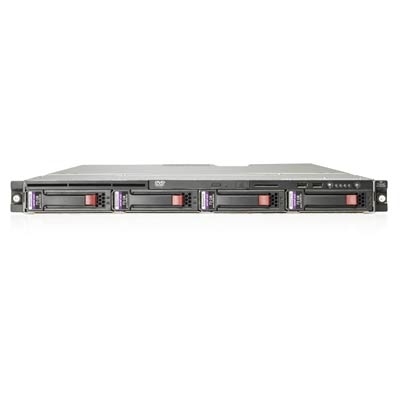 The HP ProLiant DL160 G5 server is designed for maximum compute density, basic manageability, and affordability. Featuring the latest Intel processor & chipset combinations and including large-capacity SATA and energy-efficient options, the DL160 can help you reclaim valuable data center real estate.